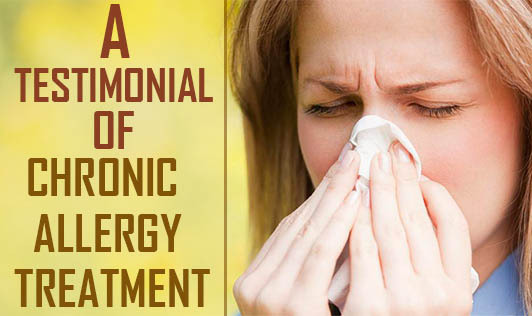 Here's an interesting testimonial of a person who suffered with chronic allergies and malabsorption syndrome, and found immense relief from NAET treatment from Dr. Sister Naina. Mr. Sujay Kuruvila suffered from the above mentioned problems for 18 years and had undergone several treatment regimens from alternate therapists which did not give him relief. Allopathy did give him temporary relief but he had to depend on dietary restrictions and medications. He had lost a lot of weight and was anemic. A few months ago he discovered NAET (Nambudripad Allergy Elimination Technique) clinic in Koramangala, Bangalore. This treatment technique has been developed by Dr Devi Nambudripad and is based on balancing the energy channels in the body. Kuruvila visited the clinic with faith and hope of getting rid of his problem. Within 3 months of regular treatment, he found great relief. His dietary restrictions and medications were reduced. His tiredness and weight loss improved. He now recommends this form of treatment in conjunction with allopathic diagnostic procedures.